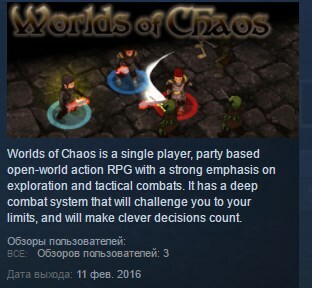 Worlds of Chaos is a single player, party based open-world tactical/action RPG with a strong emphasis on exploration and tactical combats. It has a deep combat system that will challenge you to your limits, and will make clever decisions count. Battles are fast-paced, and you will need to take a lot of decisions, each of which will help you overcome the difficult foes that you encounter. Choosing which spell to use, when and how to use them, and the positionning of your warriors and choosing the right targets are what will bring you victory. ★ Single player action RPG where you control a party of 5 characters that you create with no class restriction, they are how you decide, completely. ★ Very intense real-time tactical gameplay that keeps you on your toes. ★ Battle speed has been adjusted to give the players enough time to think and act, but are fast enough to make it thrilling, fun and sometimes a bit overwelming. This gives a feeling of emergency and satisfaction for each of the well deserved victories. ★ Deep combat system that rewards clever party organisation and statistical skill outside of combat, and wits and fast tactical thinking inside combat. ★ No dead time in this game unlike most rpgs : corpses are auto-looted, you can fast-travel to explored places at any time, time consuming parts are taken off this game to keep the most interesting ones : exploration, combats, fast loots, fast shopping, fast and simple party management.